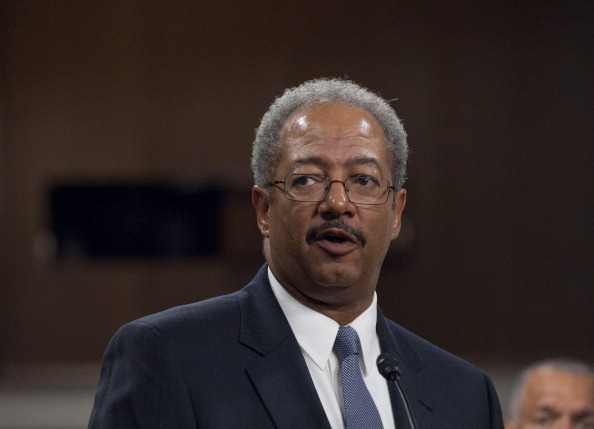 PHILADELPHIA — A federal judge has sentenced Former Pennsylvania Congressman Chaka Fattah to 10 years behind bars on charges of racketeering, fraud and money laundering. Earlier this year, Fattah, 60, was convicted of misspending government grants and charity money to fund his campaign and personal expenses, even as he and his TV anchor wife earned more than $500,000 a year. Fattah spent two decades in Congress before losing the primary this year. As he awaited his sentence, Fattah said he had “mixed emotions”: saddened to find himself in court but grateful for the work he was able to do. Rep. Chaka Fattah responds to corruption charges: "This is not Deflate-gate"
A jury this year found that Fattah took an illegal $1 million loan from a wealthy friend to prop up his failed 2007 campaign for Philadelphia mayor. He then repaid some of it with federal grant money from NASA that he had steered to an education nonprofit run by loyal former staffers. The nonprofit efforts — including a NASA-funded mobile science classroom emblazoned with Fattah’s name that roamed Philadelphia during the mayoral campaign — helped promote Fattah’s political career, prosecutors said in their sentencing memo. The jury convicted him of leading a five-person racketeering enterprise that included the loyal aides and political consultants who did his bidding, comingling campaign, nonprofit and government funds and using them as directed for Fattah’s personal and political needs. For example, Fattah used $23,000 in nonprofit funds to repay his son’s college loans and took an $18,000 bribe to try to help a friend become an ambassador. He even lobbied President Barack Obama on the friend’s behalf, to no avail. Fattah and his wife used the $18,000 for a down payment on a Poconos vacation home. They told authorities the money covered the friend’s purchase of a Porsche owned by Fattah’s wife, but the Porsche never left their garage. “For someone so interested in advancing education for the disadvantaged, you had the temerity to steal from the Educational Advancement Alliance, a nonprofit supported by government funds,” Bartle said. The judge said it was equally “astonishing” that Fattah would steal money to cover his son’s debts, to pay taxes and to buy a family vacation home. Fattah insists the Justice Department, though led by fellow Democrats, has been out to get him and his family for years. His son, Chaka Fattah Jr. is serving a five-year prison term in an overlapping fraud case that went to trial last year. Chaka “Chip” Fattah Jr., who never finished college, was convicted of using fraudulently obtained business loans to fund his jet-set lifestyle. Fattah, who earned $174,000 as a congressman, is married to longtime Philadelphia news anchor Renee Chenault-Fattah. They have two school-age children. Chenault-Fattah, who is also a lawyer, spent 25 years with WCAU-TV before she resigned after the indictment named her a participant in the bribery scheme. She was never charged and has denied wrongdoing. Two of Fattah’s political consultants pleaded guilty in the case and testified against him. The four others convicted at trial will be sentenced later this week. They include former Philadelphia Deputy Mayor Herbert Vederman, of Palm Springs, Florida, who had sought the ambassadorship. On Monday, U.S. District Judge sentenced Fattah to 10 years in prison. He was ordered to report to prison by Jan. 25, 2017. Fattah, who began his career in the Pennsylvania statehouse and entered Congress in 1995, lost the spring Democratic primary days before his trial began and resigned after his conviction in June. Former state Rep. Dwight Evans, a fellow Democrat, now holds his seat.